Transport for Cyprus (via our contact Panayiotis) were accommodating and able to provide a minibus with the condition that we met their 15 pax minimum. At first I thought this might be a daunting task (and to be honest, I didn’t want to start coordinating a group larger than 10 pax); but it turned out that other people were having issues finding a private shore excursion for Cyprus (other than the large tour buses offered by the ship). Not only did we end up with 18 pax for our minibus (easily meeting the minimum); I eventually ended up with THREE mini-buses with 18 pax per bus, for a total of 54 guests! At this point, I thought I had lost my mind and some organizational skills had to come into play. I divided up Cruise Critic Roll Call cruisers into the three buses based on their Dining Venue, such that people could get to know each other (speed dial dating – LOL!) and they could then recognize each other when they were dining and perhaps share conversations regarding their adventures. This worked out quite well, number wise. We had a Luminae & MDR Bus, a MDR bus, and a BLU (Aqua Class) bus. In addition, “Group Leaders” were assigned for each bus to herd the cats at each stop. 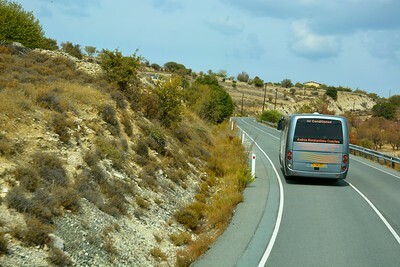 Transport for Cyprus provided a Tour Guide for each minibus which resulted in a great experience for all guests. Instead of one big bus with one guide; the end result was three smaller vehicles each with their own very knowledgeable guide. Our Suite/MDR had “Koula” who we adopted as part of our family. She had so much knowledge and history to share, she captivated us throughout the day. 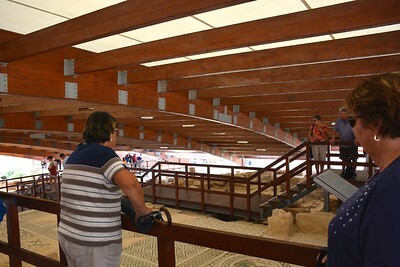 Group B (the MDR bus) had a tour guide, Lisa, who sang two songs in the Ampitheatre of Curium, as she demonstrated the amazing acoustics of this restored site. Kolossi Castle – a medieval castle initially constructed in the 13th century and then was re-built into its present form during the mid 15th century. During the 13th century, this castle served as the Grand Commandery of the Knights Templar and after the fall of Acre (which we would visit the very next day! 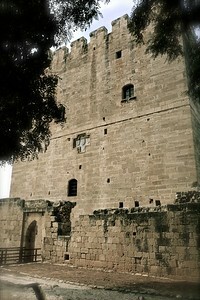 ), the castle served as the headquarters of the knights of the Order of St. John of Jerusalem. Kolossi Castle is 21 meters in height and one can climb a narrow, winding staircase to the top, for views of the surrounding village of Kolossi. 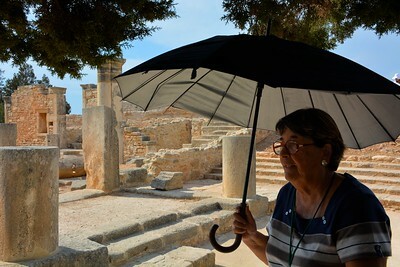 Curium (Kourion) Archaeological site – one of the island’s most important city-kingdoms in antiquity and a very impressive archaeological site. Built on the hills of the area, it overlooks a valley and beautiful views of the sea. The stunning theatre as built in the 2nd century B.C. and has been restored for use in open-air musical and theatrical performances. 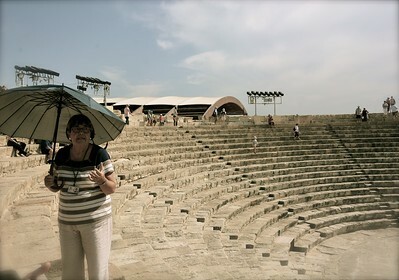 As mentioned above, one of the guides, Lisa, sang two songs to demonstrate the incredible acoustics of this theatre. Also as the ruins is the “House of Eustolios” which was originally a private villa that was converted into a public recreation centre during the Early Christian period. Some of its stunning features include well preserved mosaic floors. Sanctuary of Apollo – is an ancient monument dedicated to the God of Apollo and was believed to be the protector of Kourion. At one point, the sanctuary was one of the most important religious centres in Cyprus and Apollo was worshipped as “Hylates”, “God of the Woodlands”. Archaeological research suggest that the worship of Apollo dates as far back as the 8th century B.C. After our visit to the Kourion Archaeological sites of the Curium and Apollo, our transport vehicles headed onwards to the UNESCO World Heritage Site, Omodos Village. Omodos is located approximately 42 Km NW of Limassol within the wine-making region. The village itself is surrounded by the Troodos mountains. This quaint village features one of the UNESCO World Heritage site’s, “Painted Churches in the Troodos Region”, namely the “Holy Cross (Timios Stavros) Church. The monastery of the Holy Cross is one of the oldest and most historic on Cyprus. The church is most famous for what is believed to be St. Helen’s visit to Cyprus and that she left a part of the Holy Rope and the Holy Rood in the monastery, of which the rope was that which the Romans bound Jesus to the cross and is stained red, with the blood of Christ. After visiting the church, we had a lovely relaxing walk in the Village of Omodos and enjoyed a light snack and Cyprus Coffee. Our caravan then headed back towards the Port of Limassol taking in the scenic route of the old city, with our faithful guide explaining the sites we saw along the way back to the port. The day was very well organized for the short time that we had in Cyprus. We were thankful to see so much of this historic island and learned so much from our amazing guides.